In the Web content section, select the desired level from the Page zoom list. You can also change the page zoom using keyboard shortcuts and gestures. The zoom level you set is stored in Yandex Browser. The next time you open the page, it uses your selected zoom level. In the Zoom Level section, click Settings. Put the cursor on the line for the desired site, then click . 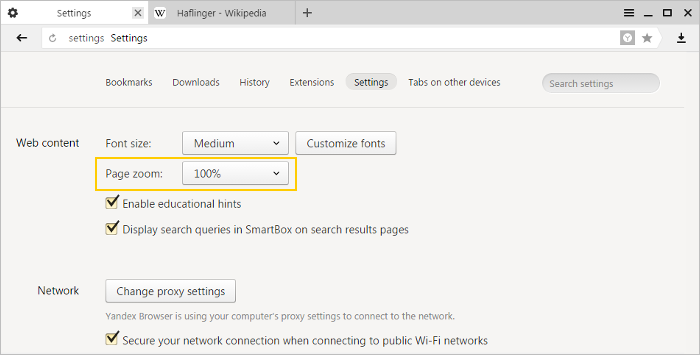 Go to the web content section and click Customize fonts. In the Fonts window, specify what fonts and text size you want to use. Disable ClearType antialiasing in Windows settings. Go to System → Advanced system settings (in Windows 10, this section is called System and Security). On the Advanced tab, go to the Performance section and click Settings. On the Visual effects tab, deselect the Smooth edges of screen fonts option. If you have GDIPP installed, disable it temporarily and check how fonts are displayed. If the text on a page is not displayed correctly, use encoding auto detection, or try changing the page encoding manually. Click → Advanced → More tools → Text encoding. Set the page encoding that you believe is correct, or select Automatically from the list. Attention. Displaying text in uncommon languages requires installing additional fonts on your computer.